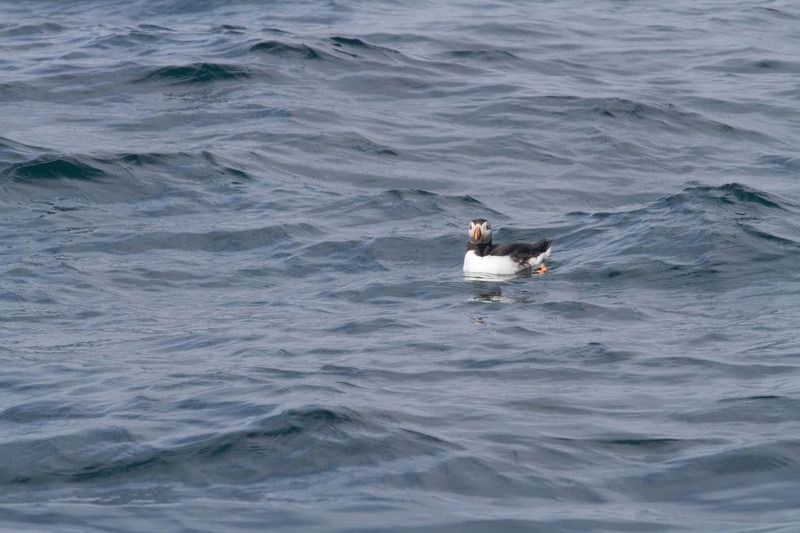 At this time of year the Firth of Forth is teaming with wildlife – seals, razor bills, guillemots, cormorants, gannets and of course the cute puffins. I only have to scroll through my Instagram feed to see these cheeky wee birds on every other photo (not complaining!). 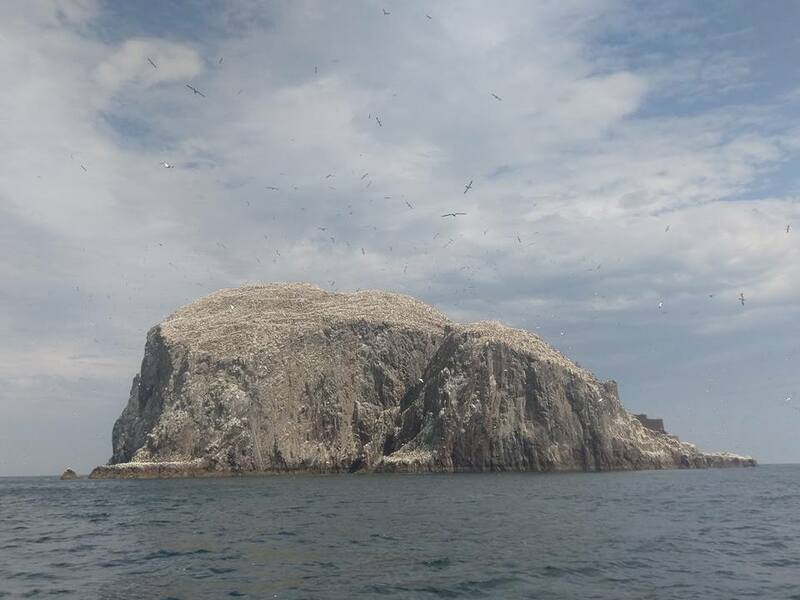 So when we were invited by the Scottish Seabird Centre to go out to the islands of both Craigleith and Bass Rock trip on a catamaran, of course, we jumped at the chance. When we arrived in North Berwick it was a bit grey and the air was damp but as the age old saying goes “if you don’t like the Scottish weather wait half an hour and it will change,” and it did. Glorious sunshine followed and it was just perfect in time for our 2pm sailing. All fifty five of the catamaran’s seats were taken with visitors wanting to see the spectacle of nature out in the firth. Armed with cameras of all shapes and sizes and binoculars, we set off. The journey is an hour and it’s not long before we had our first sightings of guillemots and gulls out on the water. 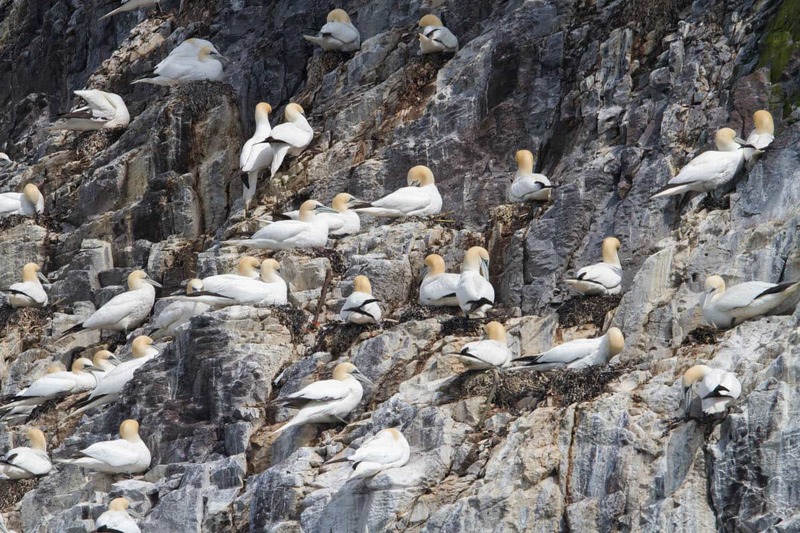 The skipper took us around the island of Craigleith and the guide told us all about the history and points out the various birds on the cliffs and in the water. It’s always good to have an extra pair of eyes (especially when they know what they are on about!). I was surprised to learn that Craigleith was once the UK’s largest puffin colony and home to over 28,000 back in 1999. Sadly due to an invasive plant called tree mallow taking over and preventing the birds from nesting the numbers were reduced. Since this time teams of volunteers have helped to clear away this rapid growing plant species and allowed for the puffins to reclaim the island, although not to it’s previous quantities. But definitely a move in the right direction. The water was relatively calm and the catamaran made light work of cutting through any waves as we made our way across to Bass Rock. 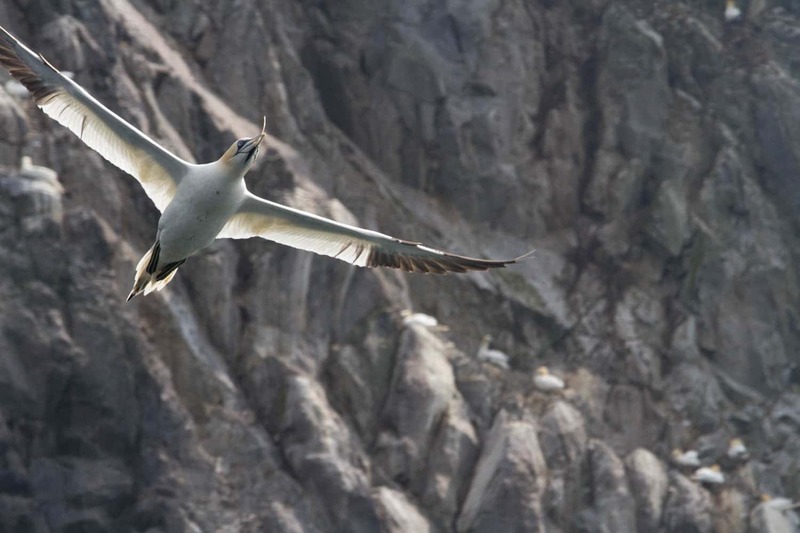 It wasn’t long before the sky above us was filled with the unmistakable sight of gannets. Their huge wing span with black tips, long necks and distinctive yellow heads makes them easy to spot. This was our first trip out to Bass Rock and we were not disappointed. 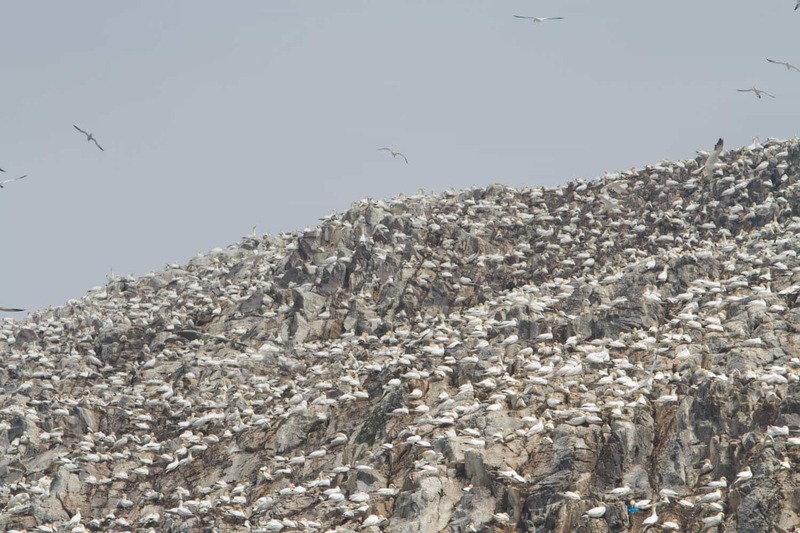 We’ve seen photos of it online and looked through our binoculars from the shore and you can just make out the tiny white dots above the island are actually birds but nothing prepares you for this sensory overload as we approached their home. The sky was filled with birds, like confetti at a wedding. The noise was similar to that of the noisiest pub you’ve ever been in with everyone chattering away and then, of course, the smell. The smell of years worth of bird poo, or guano if I am to give it it’s proper name. It was a bit ripe to say the least but all part of the experience. 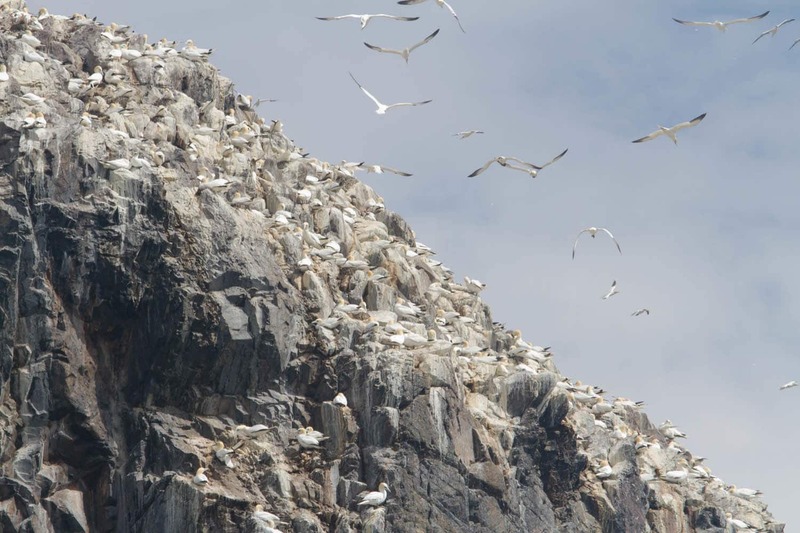 It is home to approximately 150,000 gannets, making it the world’s largest colony. 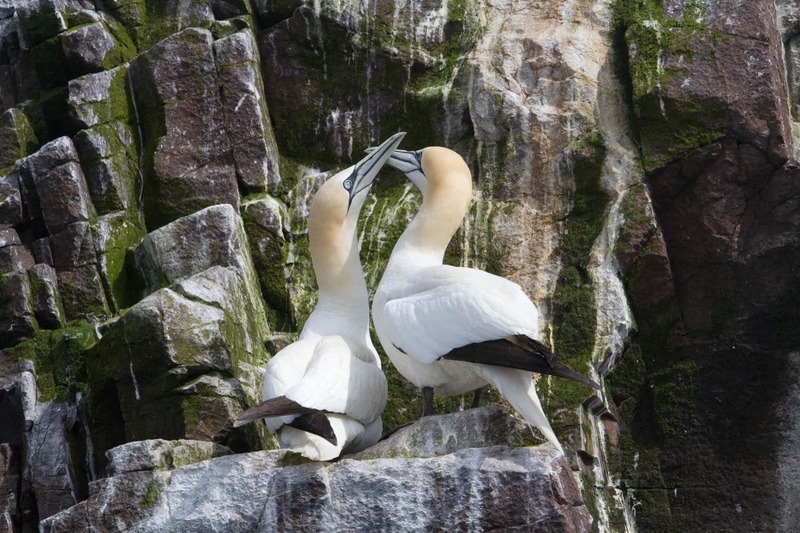 Gannets mate for life and each year when they return to Bass Rock they re-affirm their bond with an affectionate kiss or beak rubbing (as seen in the photo below). I guess after the male has been out at sea looking for food they will do this too. No different to us coming home from work and giving the other half a kiss to say hello. They have been known to fish as far away as Norway! 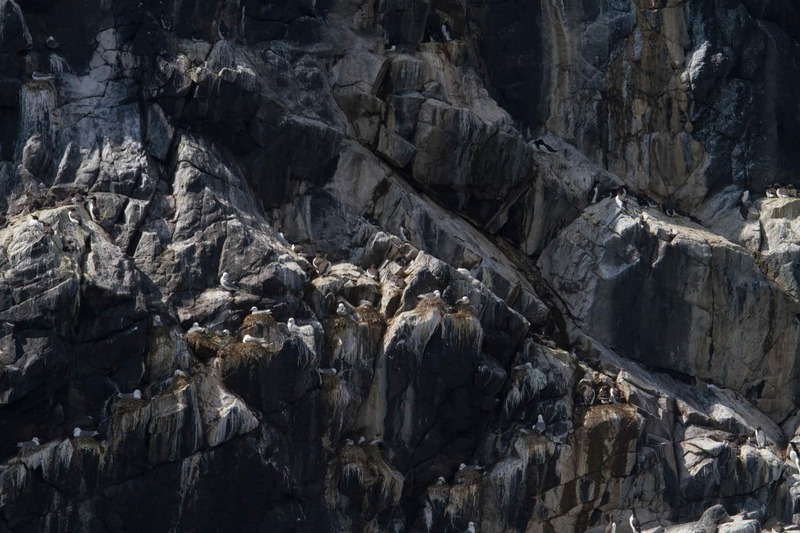 These pretty birds are not the only residents on this volcanic island, shags, guillemots and kittiwakes also make use of the smaller and lower ledges. As our catamaran slowly makes its way around Bass Rock the guide on board points out various species and facts about the birds and island. Once we have done a circuit around the colony we make our way back to the harbour. As we got further away the iconic image of the white rock got smaller and our hearts fuller for having had this experience. 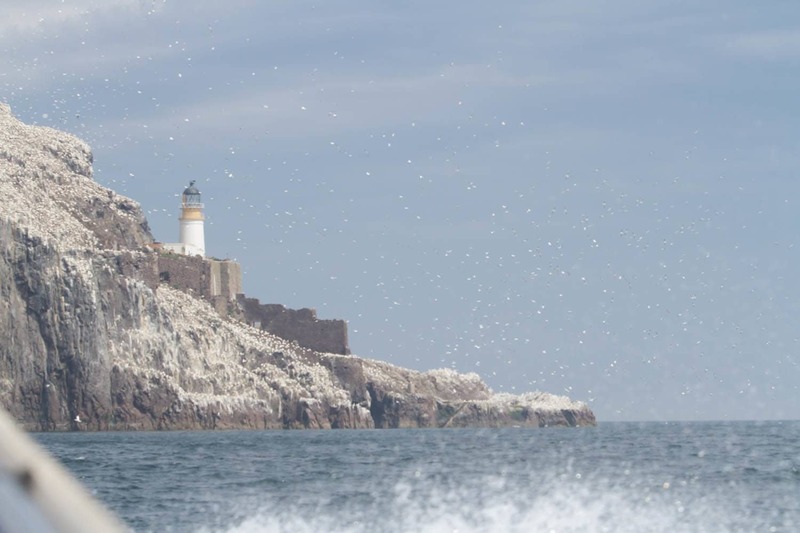 It’s fair to say we had a fabulous time during our Craigleith and Bass Rock trip and would highly recommend it. We liked the fact there was someone aboard that could answer questions about the birds for us and point things out too. It really is suitable for anyone too. On our trip we had children (aged maybe 5 or 6) and someone also on crutches. The staff did their best to ensure everyone got aboard safely and gave assistance where necessary. 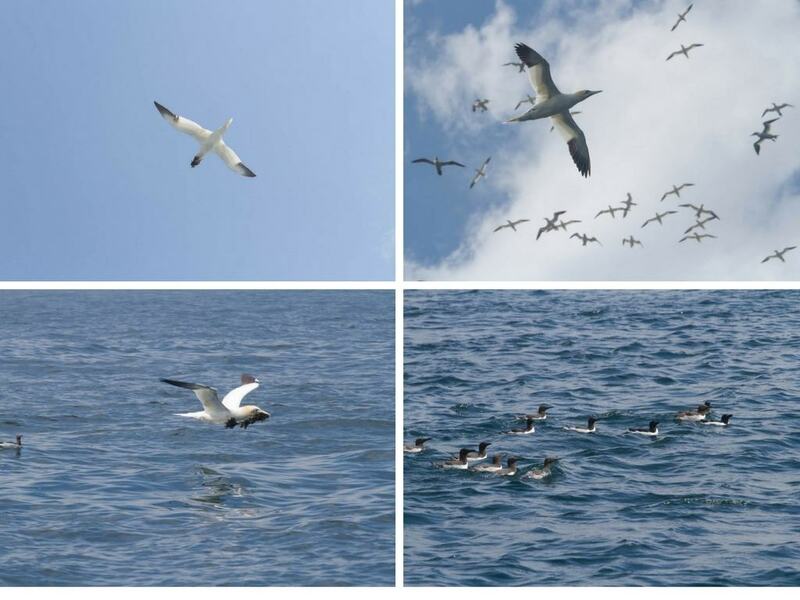 It was nice to see the seabirds in their own environment to see how elegant they can be. Certainly made me forget about how intimidating the gulls can be on shore when you are eating your fish and chips! Just a couple of tips though: even on a sunny day it is advisable to wrap up and maybe wear a hat, it can get rather blustery out on the water. The trips are popular so it’s best to book in advance. And my last tip would be don’t forget to actually look at the birds and away from your camera. I know its good to have good photos but it’s even better to have the whole experience and you wont get that if you are concentrating on something else. If you would like to win a trip on the Seabird Catamaran Cruise and tickets to the Discovery Centre (for two adults), you can enter using the Rafflecopter below. Please check out the T&C’s before entering. Good luck. 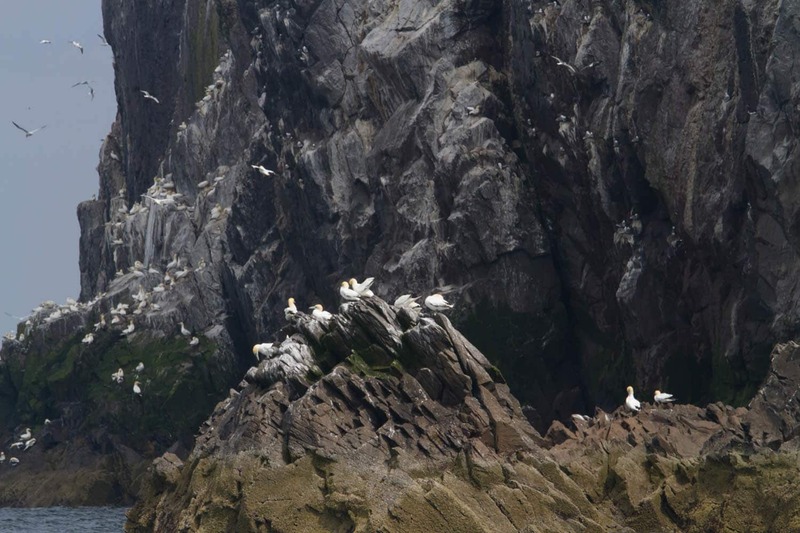 We were invited by the Scottish Seabird Centre to take this trip in return for this post and it’s images. All thoughts on Scottish weather and bird poo are my own. Ahh this looks so good! Husband and the girls went on a boat trip last week to see puffins and seals but I stayed with the dogs so I’m owed a trip so I’m entering!